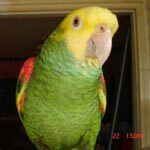 Its important they you do not scare the parrot with a towel, as vets will often use a towel, and also you dont want to increase the parrots fear of you. The best time to let him out is when you have lots of time, and can use a favorite treat to lure him back to the cage, or when he gets hungry or thirsty on his own and returns to the cage. I have found that once they go to roost at night that they can be just picked up. I am able to do this with even the scaredest cockatiels. As long as they are not scared towel scooping is fine. Great news!!! And don't worry about your husband. In time, he will accept him.